separated into two pages plus this Section Overview, which contains sample images from each page. 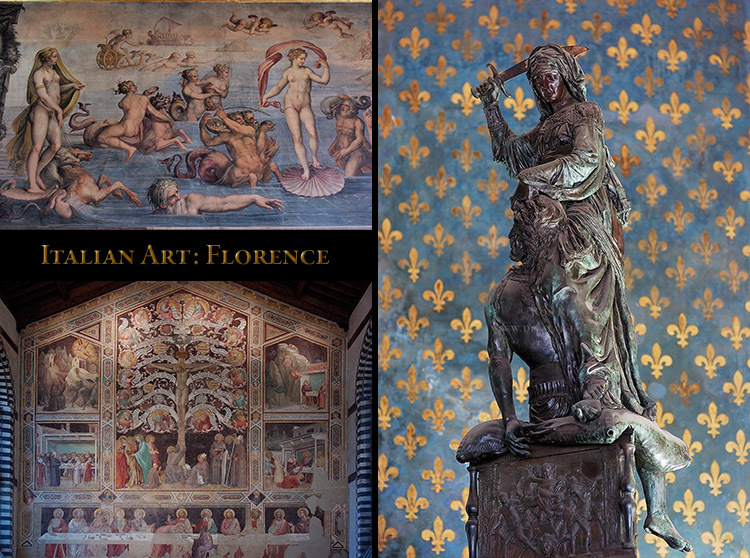 from ancient times to the Baroque period (1600-1725) and scenery from Florence and Rome. The Banner below leads to the Italy Collection where images can be selected. Images are in a number of Galleries in the Italy Collection. 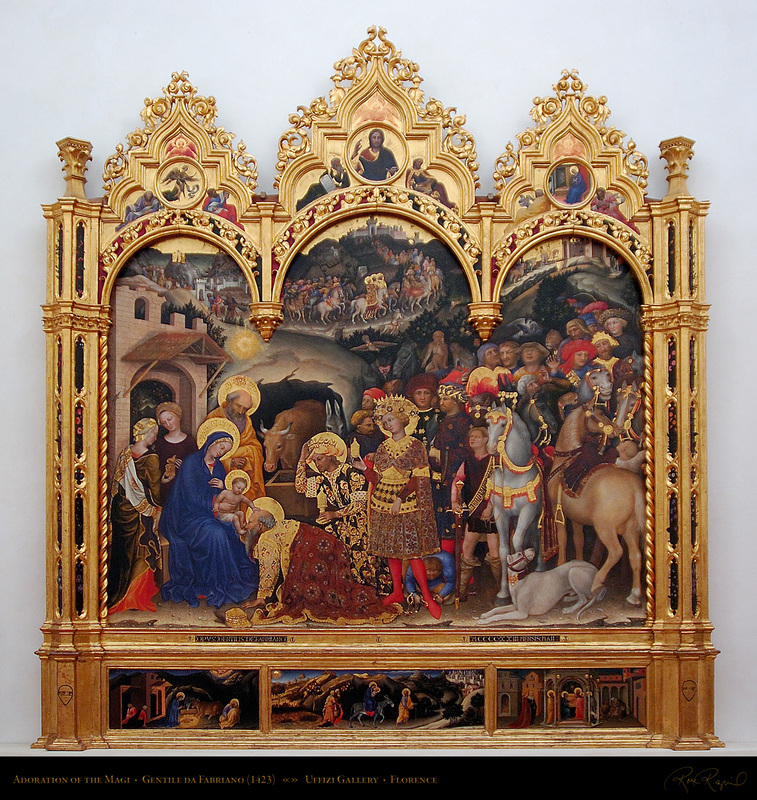 which are considered by many experts to be the crowning achievement of the Italian Renaissance. to the city to reawaken a new era pf prosperity. Cosimo was very pleased. Joseph Recognizes his Brothers and Returns Home. 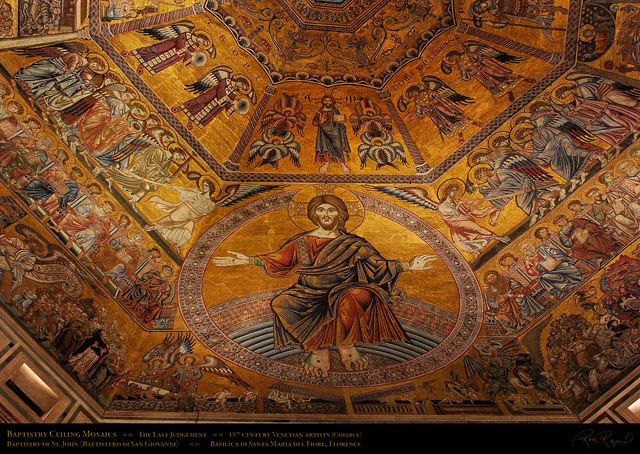 created by some of the finest Venetian artists of the 13th century, including Cimabue. 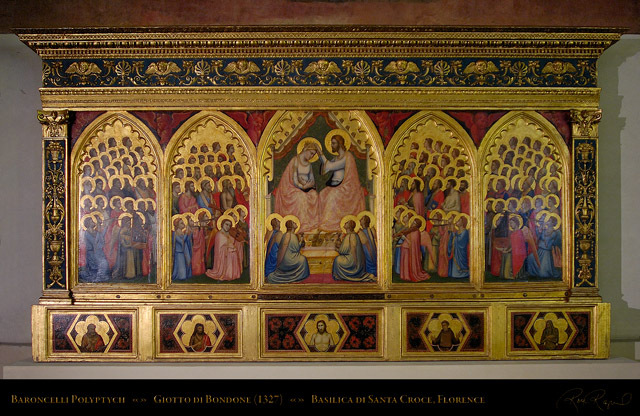 The Last Judgement section, with cartoons by Coppo di Marcovaldo (1225-1276). was dry, the canvas would be soaked to soften the glue, then removed. for expression and more of the character of a painting. 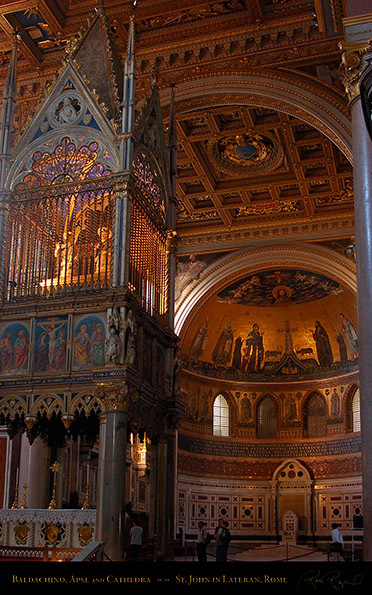 Created in 1461, the Tabernacle of the Sacrament was either intended for the Sacrament Chapel, dedicated to the Medici family saints Cosmas and Damien (as you discovered in the previous section above), or in the main chapel choir. Desiderio da Settignano created an early Renaissance masterpiece blending the new art of perspective, medium and low relief sculpture, marvelous renderings of the Christ Child and putti, and two whimsical hip-shot candle-holding figures. Alluding to the work of his teacher Bernardo Rosellini and that of Donatello, he executed what is one of the more interesting pieces of early Renaissance sculpture. The pilaster-framed upper structure is reminiscent of the Donatello Annunciation in Santa Croce, but within this aedicula is a deep barrel-vaulted corridor which spatially recedes using Brunelleschi’s newly demonstrated methods of geometric perspective. 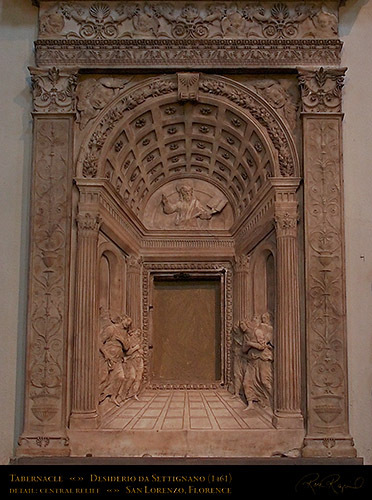 In exquisite low relief reminiscent of Donatello’s best work, Desiderio rendered a half figure above the actual door of the Sacrament closet, and halfway down the corridor, angels in low relief flit in from the side passages. The piece is subtly ornamented in a way that does not detract from the scene. The Lamentation scene below does seems to be a little out of touch with the lighthearted mood of the rest of the piece. 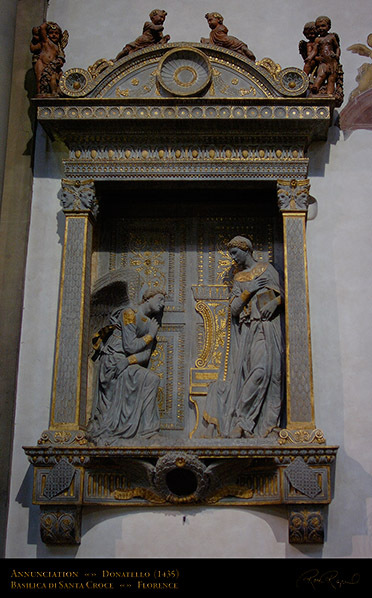 The tomb of the Antipope John XXIII, executed in marble and bronze by Donatello (Donato di Niccolo di Betto Bardi) and Michelozzo (Michelozzo di Bartolomeo Michelozzi). The last tomb of a Pope outside of Rome, at 24 feet it was the tallest sculpture in Florence at the time it was built (1420s), and one of the earliest Renaissance sculptural masterpieces. 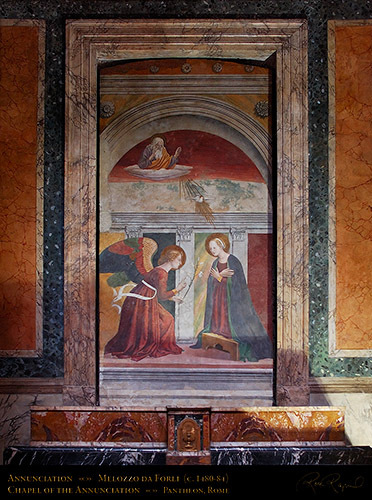 Near the Cavalcanti altar in Santa Croce is the Annunciation by Donatello (1435). This was one of his first works after his return from several years spent in Rome. 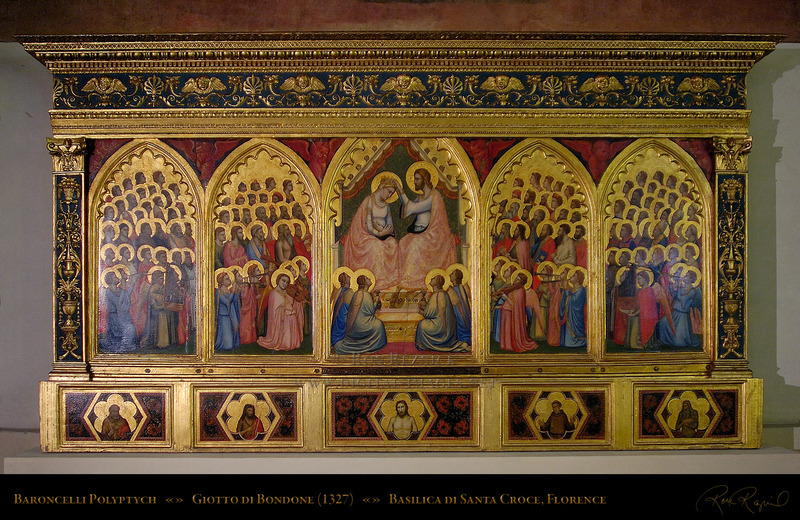 Based on 14th century iconography, it was also influenced by Classical designs. 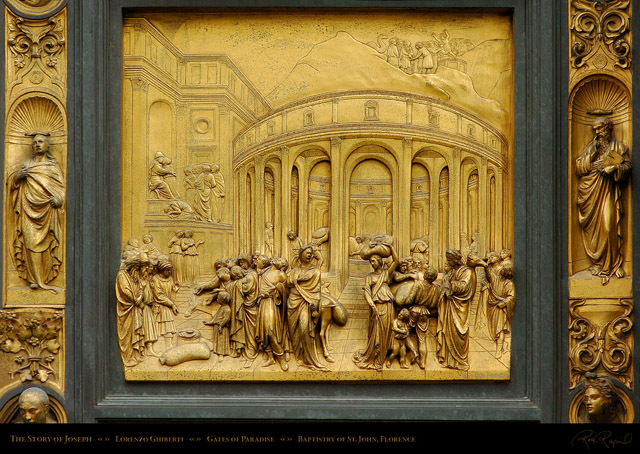 Made in gilded Pietra Serena (grey sandstone), it was originally intended for the Cavalcanti chapel altar. (It is now mounted in a recess on the south wall). wings show a crowd of angels and saints watching. Every face in the crowd shows individuality. the only one left in its original position, on the original altar, surrounded by the original artwork. are monkeys, a leopard, a macaque, a lion and other animals (including superb horses). This piece is considered to be one of the premiere masterworks of the International Gothic style. movement and tension, and his finish work was superb. It was placed here in 1841.
for error, and you must see the entire sculpture in your mind’s eye as you are sculpting. Andrea del Verrocchio was the teacher of such renowned Renaissance artists as Leonardo da Vinci, Domenico Ghirlandaio, Lorenzo di Credi and Pietro Perugino (who was the teacher of Raphael). Verrocchio (and Donatello) created some of the early sculptures in the round (all viewpoints are of equal significance and the statue can be viewed from all sides rather than being placed in a niche and viewed from a few positions in front of the sculpture). The Putto with Dolphin is sculpted in the round. 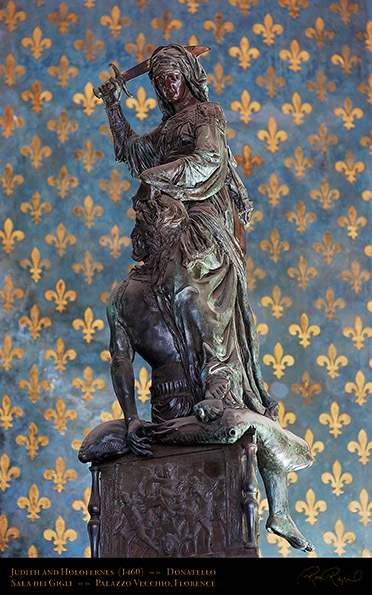 Created for Lorenzo de’ Medici (the Magnificent) for his villa at Carregi for use as a fountainhead, it was originally part of a group of sculptures that were delivered (the others were lost). Cosimo I de’ Medici had the Putto with Dolphin transferred to the Palazzo Vecchio in 1557, where it was the fountainhead for the porphyry and marble fountain in the first cortile (courtyard). 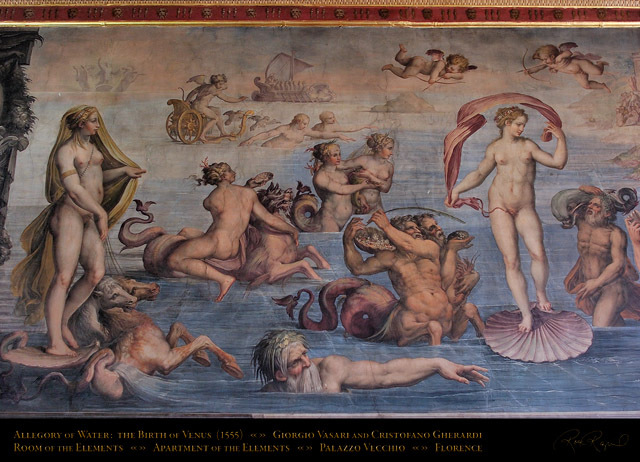 Today, a copy made by Bruno Bearzi acts as the fountainhead and the original is displayed in the Apartment of the Elements. 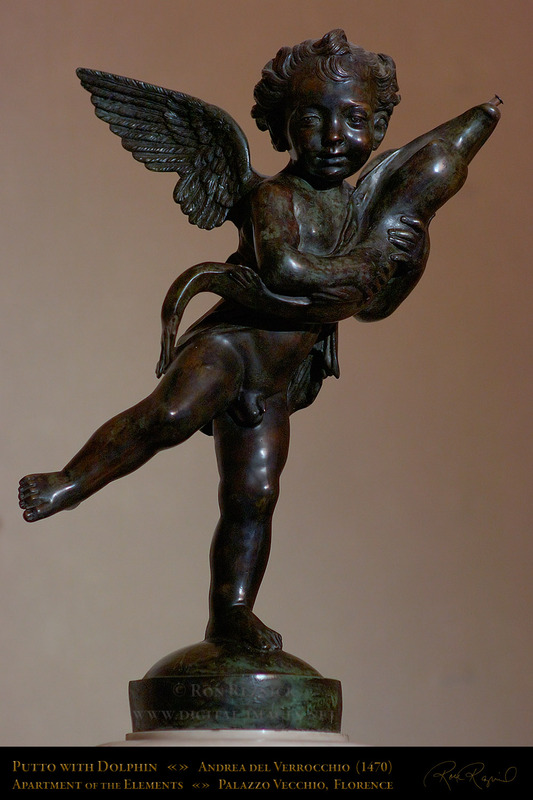 The Putto with Dolphin was created during the same period in which del Verrocchio created the bronze group Christ and St. Thomas for Orsanmichele, which was an elegant solution to the problem of placing two more than life-size statues into a niche designed for one (the statue of St. Thomas was placed entirely outside the niche, with only one foot on the ledge). At this same time, he also created the enormous gilded-bronze ball for the top of the lantern of Brunelleschi’s Dome at Santa Maria del Fiore, destroyed by a lightning strike in 1600. Judith and Holofernes (1460) was one of Donatello’s last works. Like his David (in the Barghello), it was created in the round (meant to be seen from all sides), and along with David was one of the first Renaissance statues to be created in the round. They were both done for Palazzo Medici-Riccardi, where the two original free-standing Renaissance statues stood together (until they were split up when the Medici were temporarily ousted from Florence in 1494), with Judith being moved to the front of the Palazzo Vecchio. A copy now stands in that position. This is the original. Judith is considered to be the symbol of liberty and the victory of the weak over the oppressor. It depicts the assassination of the Assyrian General Holofernes by Judith, the Jewish widow, who got into the General’s tent by promising to inform on the Jewish leaders, then when he was drunk, she decapitated him and took the head back to her Jewish compatriots. The statue was originally gilded (some gold remains on the sword). The base of the statue resembles a cushion, similar to the St. Mark which Donatello created for Orsanmichele. 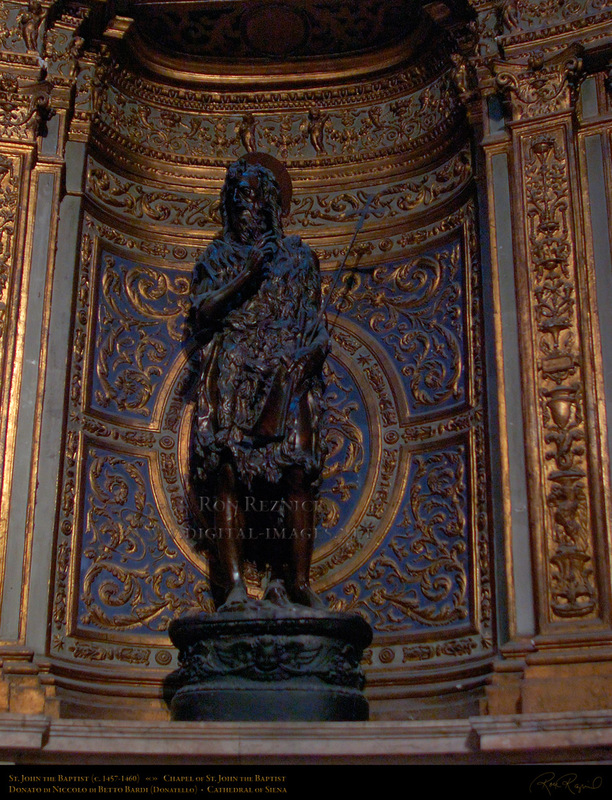 Another of Donatello’s final works is the statue of St. John the Baptist (1457) in the Cathedral of Siena, this one rendered in an unusual style, with John the Baptist portrayed as an ascetic with an emaciated body. Click here for an image. was primarily painted by Vasari, with detail work by Gherardi. Detail crops are below. from the Medici Venus and Praxiteles’ Aphrodite for the shape of the female bodies. Above Thetis in the top left background is Dawn, and with her back to us is Galatea. The two beyond Galatea’s Hippocamp are Leucotea and Pistro (a beautiful virgin). drawn by Doves. Top center background is the ship Argo, vessel of the Argonauts. the Terror of the Sea, who commands the Sea to be calm while Venus is born. 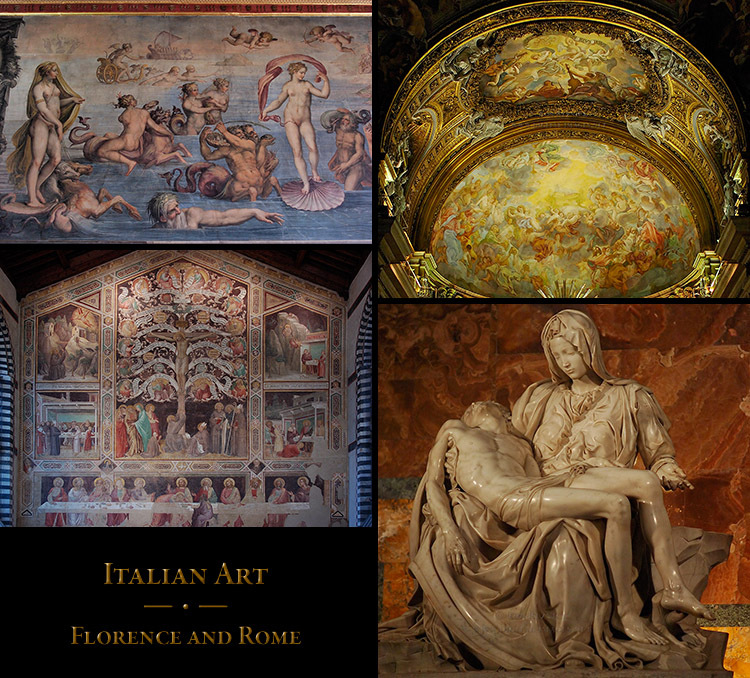 Click the Display Composite above to visit the Italian Art: Florence page. 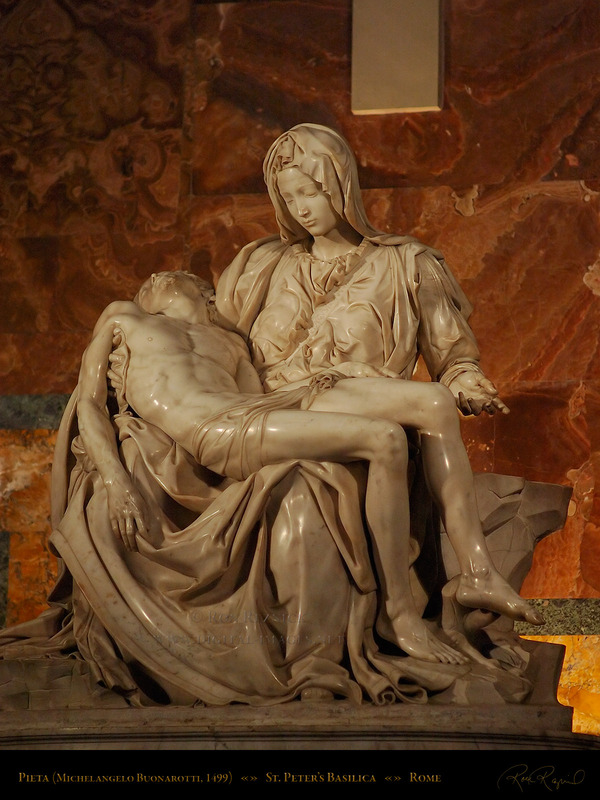 famous religious sculpture, and it is very likely one of the most recognizable sculptures of any kind. He later regretted that his emotions got the better of him, vowing to never sign work again. the elongated limbs of Christ’s body, and Mary’s arm extends towards the viewer. the sculpture was intended to show the “religious vision of abandonment”. The composition forms a pyramidal structure with the apex at Mary’s head. same amount from the dome ribs to create the world’s largest bronze structure (98 ft.). 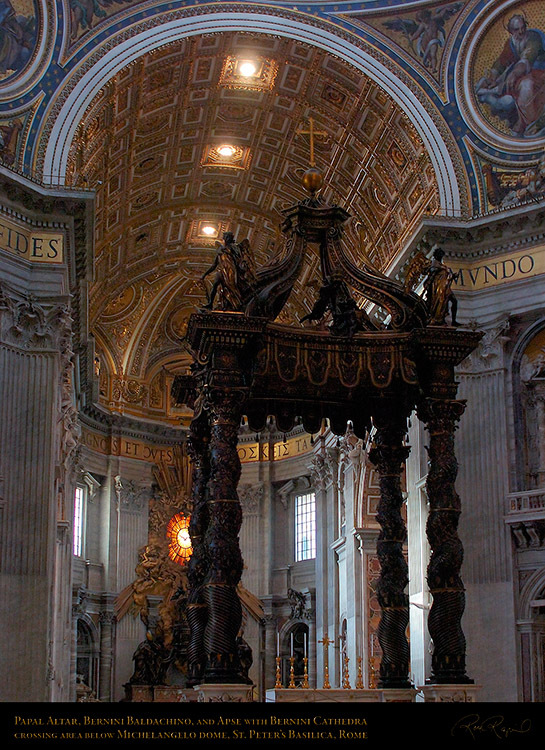 upper cornice which supports a bronze orb (symbolizing the world) topped with a cross. volutes, orb and cross. He attached the canopy structurally to the column cornices. crossing under the dome and acts as a visual centerpiece to the nave. to the enormous space in which they were placed. 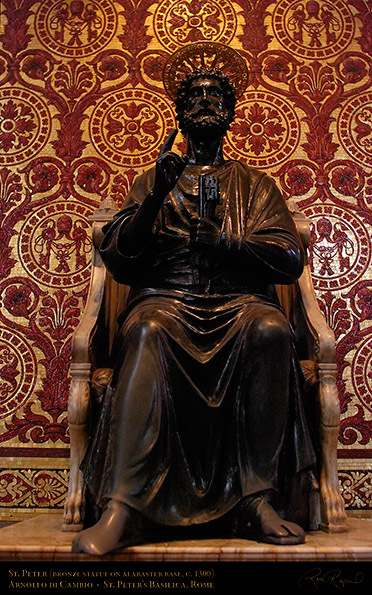 Arnolfo di Cambio’s sculpture of St. Peter, c. 1300. Placed against the Pier of St. Longinus, this highly venerated sculpture has feet worn down from centuries of pilgrims kissing and rubbing them. St. Peter is seated on an alabaster throne, and is mounted on an alabaster base. The right foot protrudes from the base and is the most worn of the two. The alabaster base was created in 1757 by Carlo Marchionni. The statue has long been regarded as having been created in the 5th century, commissioned by Pope Leo I (440-461), but modern analysis has dated the statue to the 13th-14th century. The final masterpiece of GianLorenzo Bernini: the Monument to Alexander VII (1678). 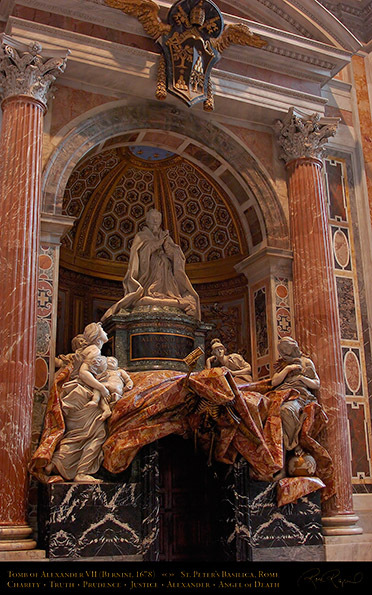 Bernini, who was the Chigi Pope’s favorite, created the monument with the assistance of several talented artists in his studio. The Pope is surrounded by the allegorical statues of Justice, Prudence, Charity and Truth. 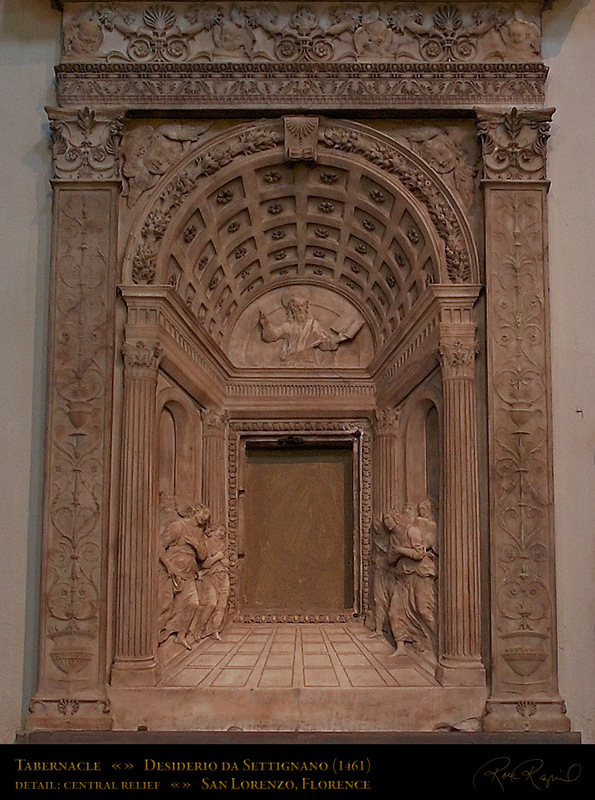 The monument is swathed in an enormous drapery of Jasper which defined the shape of the base, and Bernini used the Jasper over the door (an exit from the basilica) in an innovative way. Note the skeleton in the Jasper over the door. The marble and alabaster in the nave was added between 1858-61 and the high altar was built by Antonio Sarti (who also covered the apse in marble). The antique yellow marble columns support a Neo-Classical pediment over which are two angels (Francesco Benaglia and Filippo Gnaccarini) on either side of the aureole containing the IHS monogram with three smaller angels below the aureole (by Rinaldo Rinaldi). The altarpiece is the Circumcision by Alessandro Capalti. The apse vault frescoes, by Giovanni Battista Gaulli. The main vault depicts the Adoration of the Mystical Lamb, in which the reclining lamb is surrounded by a group of raptly gazing figures. The fresco in the arch vault has musical angels playing a harp, trumpet, viola and a tambourine while watching another group of three angels, floating overhead carrying a Latin inscription reading “Calling the Name of Jesus”. 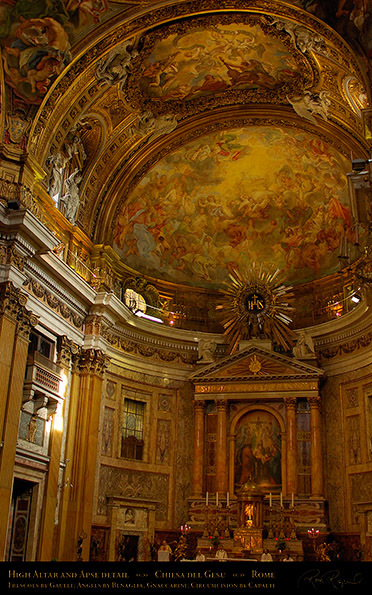 Considered to be the finest ceiling fresco in Rome other than the Sistine Chapel. Gaulli received the commission to create his masterwork when he was only 22 years old. His patron, GianLorenzo Bernini (the foremost Baroque artist in Rome), was successful in recommending him for this most prestigious job. 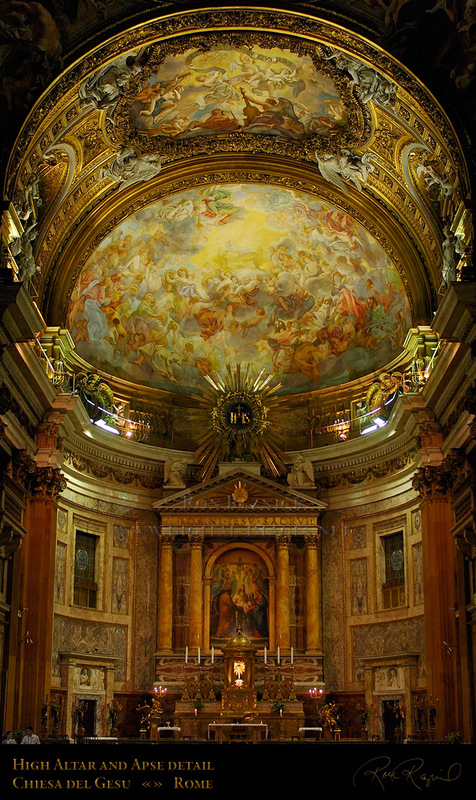 Gaulli, Antonio Raggi and Leonardo Reti decorated the entire dome, lantern and pendentives, vault, transept ceilings and window recesses with frescoes and the foreshortened trompe-l’oeil stucco and wooden figures used to create the 3D effects that make the fresco work so striking. Triumph of the Name of Jesus (also known by several similar names) was created within a gilded frame which is supported by stuccoed angels and unveiled on Christmas Eve, 1679 to a stunned audience. A horde of floating children surround the luminous golden monogram IHS, and the children are in turn surrounded by older figures clamoring for a view. Men and women, Kings and peasants surround the outer group, sitting on clouds and staring at the spectacle. 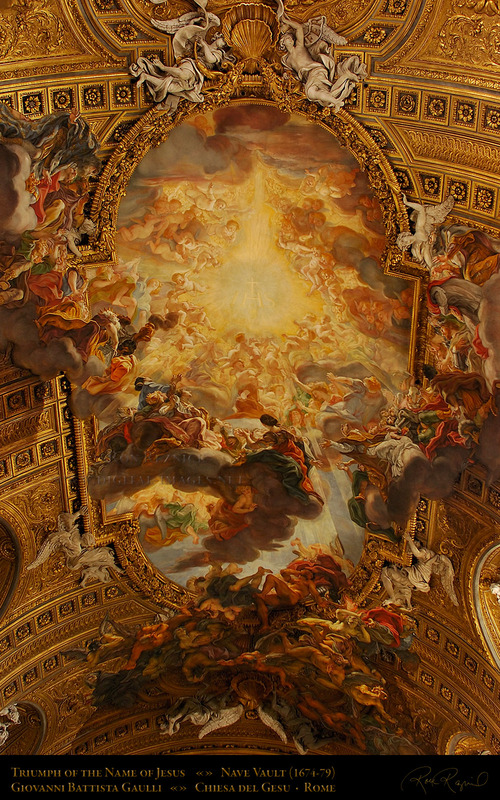 An angel peeks out of the lower cloud at the scene of trompe-l’oeil figures of fallen angels and heretics tumbling in disarray out of the lower edge of the composition. The scene can give you a pain in the neck as you strain to take it all in. A masterwork of Baroque theater. Raggi’s foreshortened wood and stucco figures were attached to the ceiling and then painted by Gaulli so they seemed to be a part of the fresco. You really have to look twice when you first see it. There were a number of classic double-takes by people who walked over to look while I was shooting (I understood completely). The effect must have been astounding in the 1680s when people first saw it. artists of the Forlivese School, as his works exhibited an early use of geometric perspective. in Florence and later in Rome. 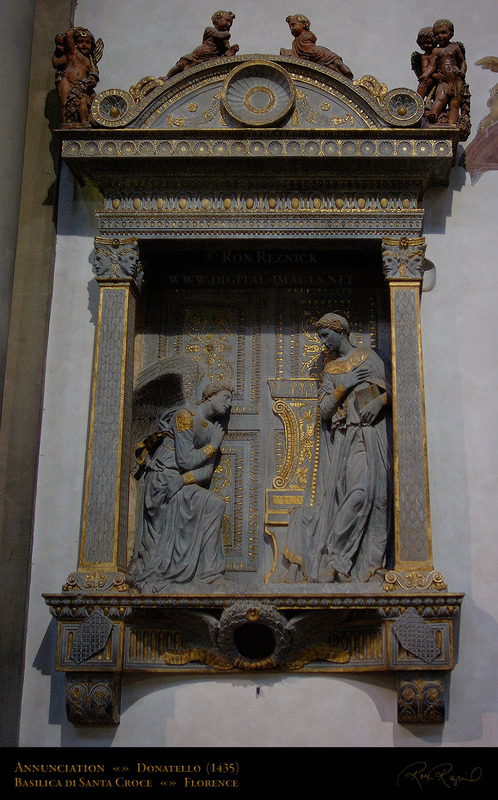 Melozzo influenced Raphael, Michelangelo and Donato Bramante. The 12th century apse mosaic of Santa Maria in Trastavere. The primary mosaic in the vault of the apse was created in 1140-48 during the rebuild by Innocent II. 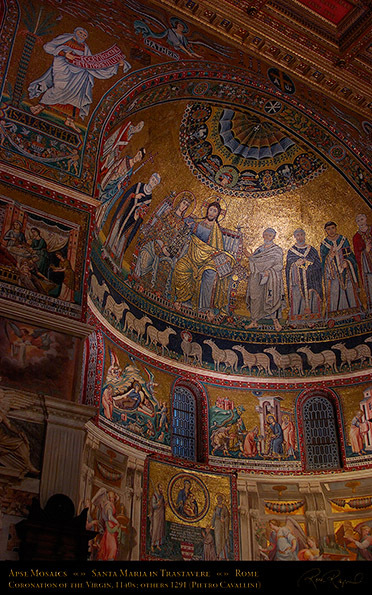 The vault mosaic depicts the Coronation of the Virgin. 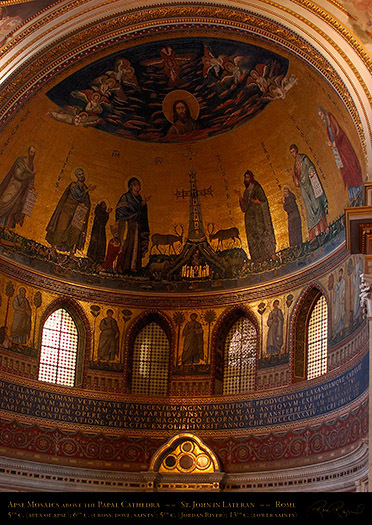 The 13th century apse of Santa Maria Maggiore with mosaics by the Franciscan monk Jacopo Torriti. 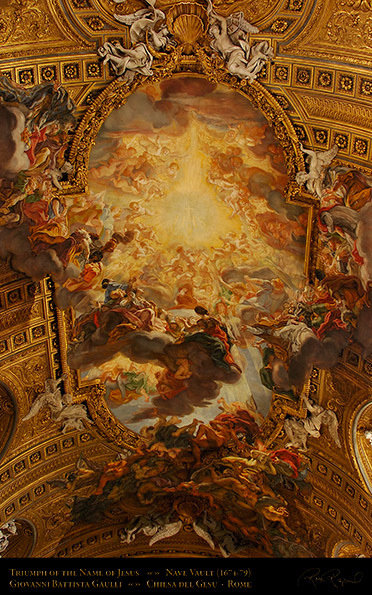 Above the altar painting (The Nativity, by Francesco Mancini, c. 1750), is the central mosaic depicting the Assumption of Mary. seated on an Oriental throne with choirs of angels at the base of the medallion. St. John the Baptist, St. John Evangelist, St. Anthony and Cardinal Colonna. On both sides of the right window are mosaic Scenes from the Life of Mary. older mosaics (e.g. 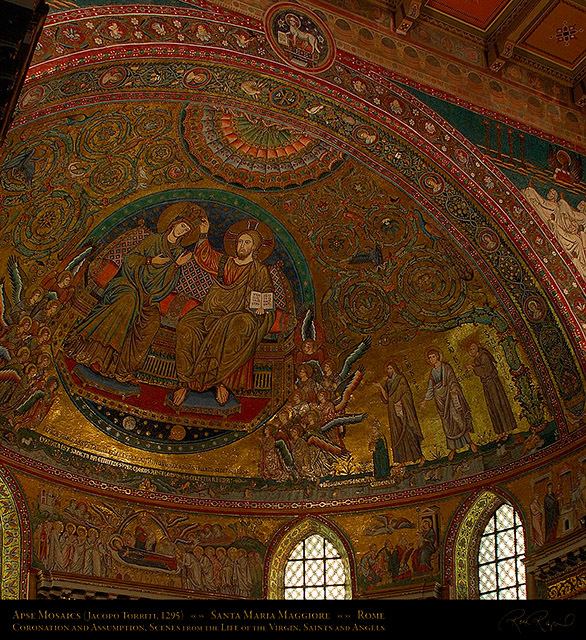 San Clemente and Santa Maria in Trastavere). In front of the keystone is the Agnus Dei (the Lamb of God). The composite shows the left and right sides of the chapel together. 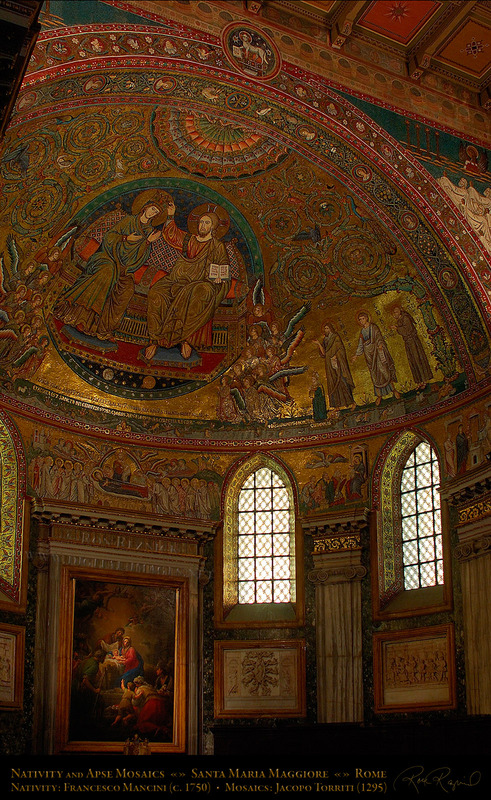 Between the two sides is the altar of the Salus Populi Romani, shown earlier. 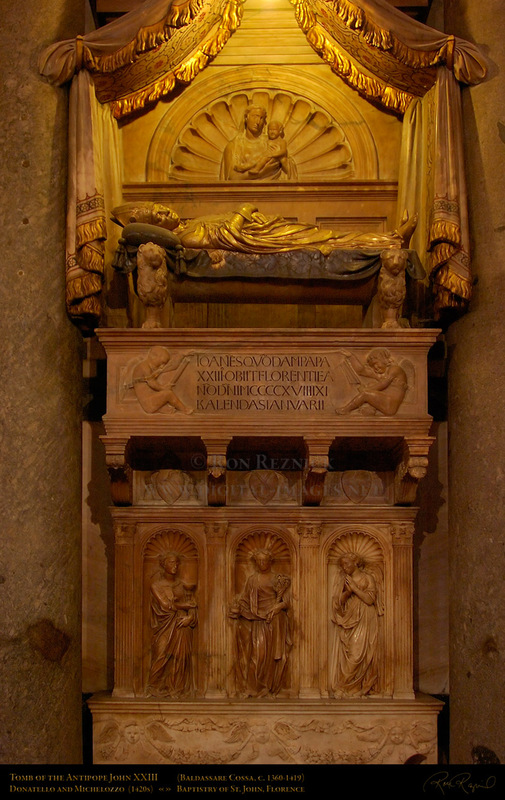 On the left is the tomb of Paul V, which was designed by Flaminio Ponzio. and the putti in the frieze between tombs were by Stefano Maderno. The center statues are King David and High Priest Aaron. 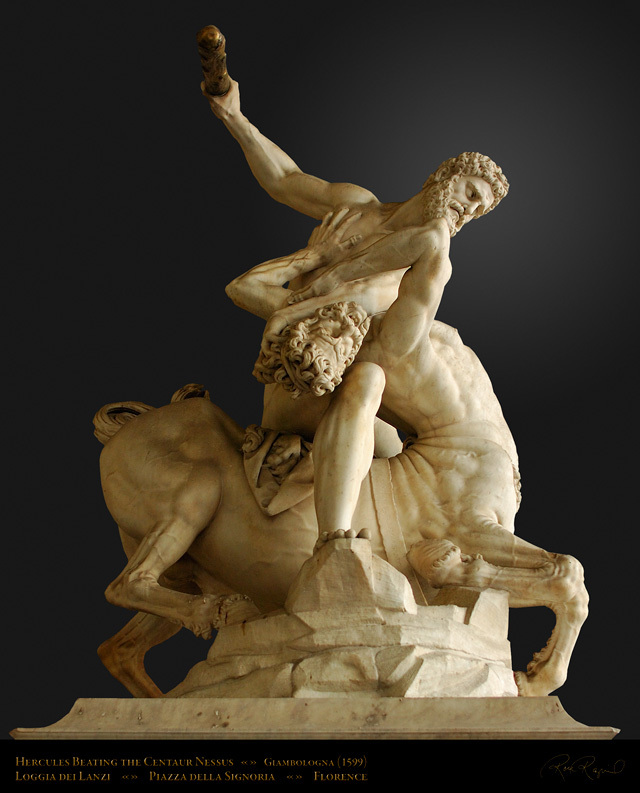 Both of these statues were sculpted by Nicholas Cordier. 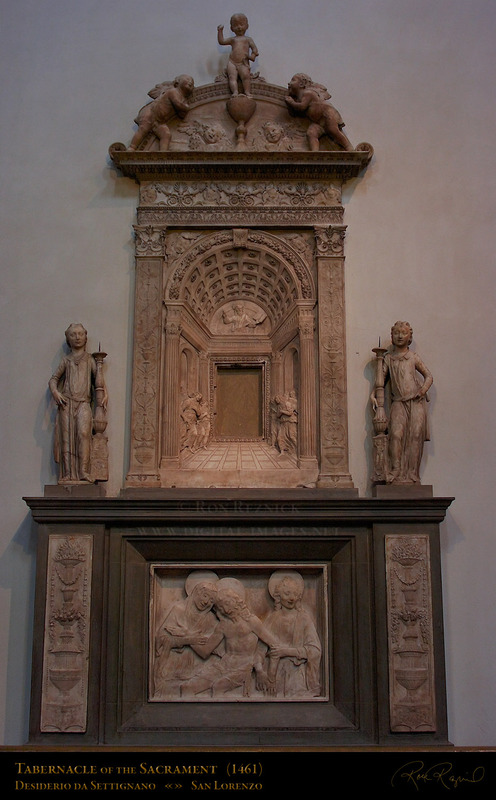 On the right is the tomb of Clement VIII, also designed by Flaminio Ponzio. 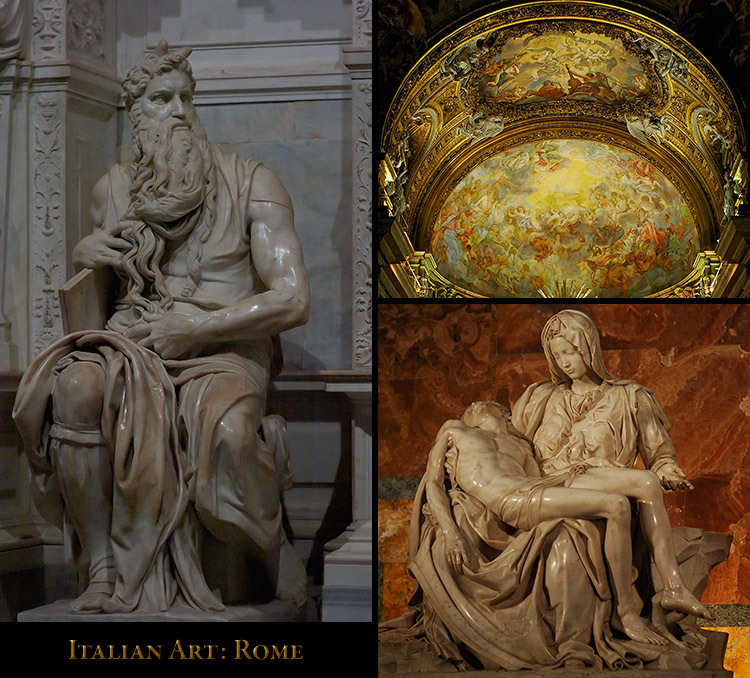 famous Baroque artist GianLorenzo Bernini), who also sculpted the Caryatids. Other reliefs were created by Ippolito Buzio, Antonio Vasoldo and Camillo Mariani. The Basilica of St. John in Lateran, viewed from the central nave towards the Apse and Papal Cathedra, past the Gothic Baldachino by Giovanni di Stefano (1367), from a design by Arnolfo di Cambio. A 1134 x 1600 detail crop of the four sections of the Apse Mosaics. The River Jordan is the oldest section, dating from the founding of the Basilica in the early 4th c. The upper section of the vault is 4th or 5th century. The center section above the River Jordan with the Cross, Dove, and Saints is 6th c. (restored in the 13th c.), and the lower section was 13th century work by Jacopo Torriti and Jacopo da Camerino. 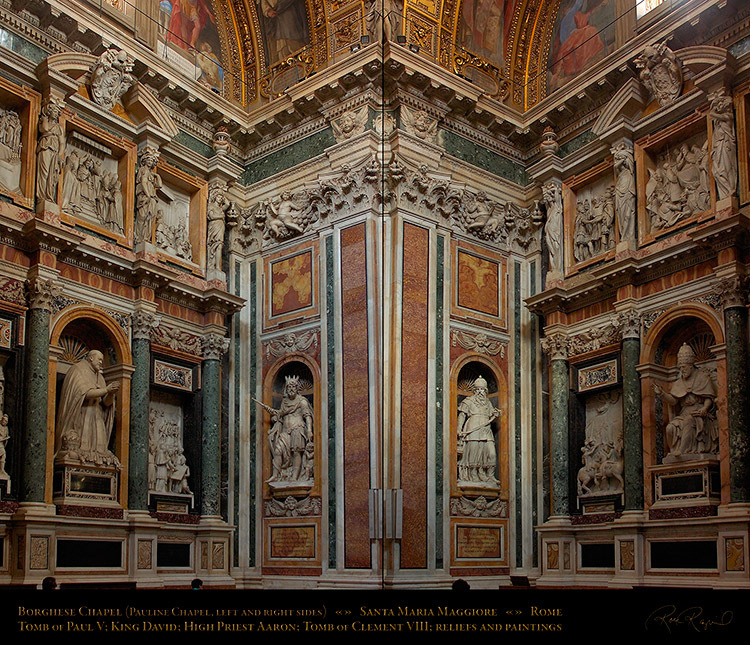 Click the Display Composite above to visit the Italian Art: Rome page. 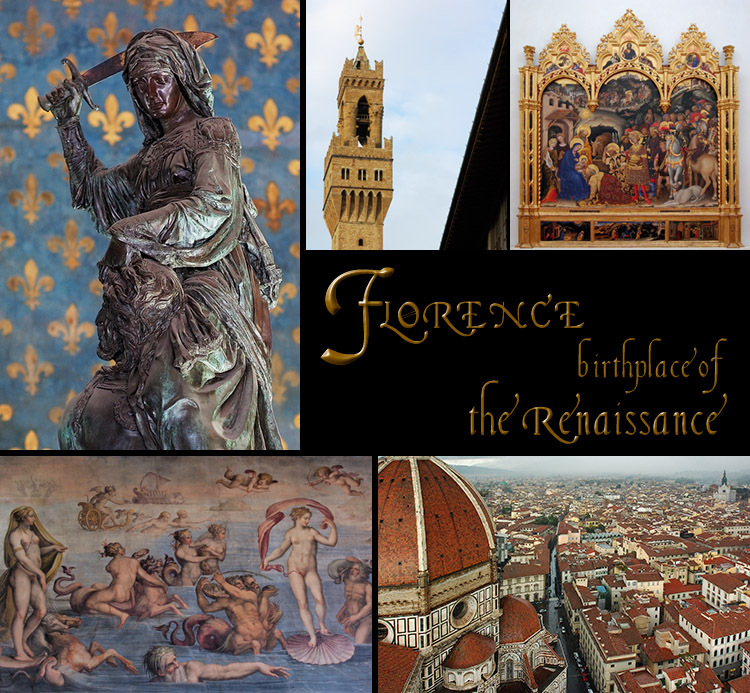 Click the Display Composite above to visit the Florence Portfolio in the Scenic section. 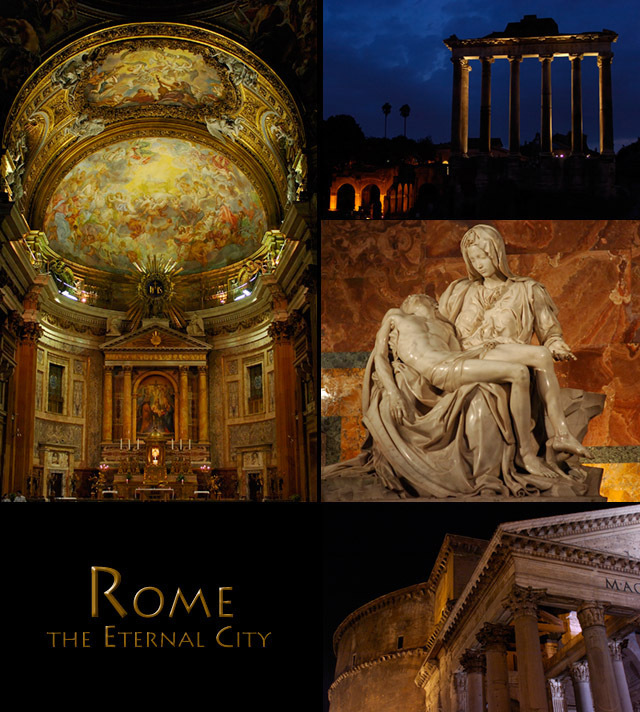 Click the Display Composite above to visit the Rome Portfolio in the Scenic section.